Contract and Commercial Surety--Delaney Insurance Agency, Inc.
A bid bond is issued as part of a supply bidding process by the contractor to the project owner, to in hopes guarantee that the winning bidder will undertake the contract under the terms at which they bid. A performance bond, also known as a contract bond, is a surety bondissued by an insurance company or a bank to guarantee satisfactory completion of a project by a contractor. 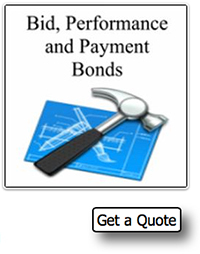 A job requiring a payment andperformance bond will usually require a bid bond, to bid the job.